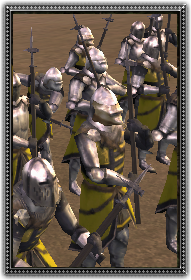 These men are the elite of the French aristocracy, and can to afford the best in arms and armour, not just for themselves, but also for their horses. As the flower of French chivalry, they have an elan that is unrivalled. Although they have a reputation for rashness when mounted, many are pragmatic enough to realise that sometimes it is better to fight on foot.